Welcome to the six hundred and eleventh of my blog interviews with novelists, poets, short story authors, biographers, agents, publishers and more. Today’s is with scriptwriter & crime author Tony Glover. A list of interviewees (blogged and scheduled) can be found here. If you like what you read, please do go and investigate further. Morgen: Hello, Tony. Please tell us something about yourself, where you’re based, and how you came to be a writer. Tony: I live in Newcastle upon Tyne. I was born in Northumberland – the Debateable Lands, as they were known in the past – England’s last wilderness. I started writing as a child – I was always making up stories in the car on the way to school. When I was at secondary school I had some of them published in the school magazine. Morgen: I love it when I hear that someone started writing early. I was in my late 30s and would have loved to have realised earlier how thrilling it is to make things up, but I remind myself that I have all those years’ experience to write about. What genre do you generally write and have you considered other genres? Tony: My first love was writing for film – shorts and so on. Then I had a radio play on the BBC which won a bronze Sony award. After that I had a pilot for a drama broadcast on ITV. I’ve had a couple of stage plays produced. But it was only recently I started writing crime stories. My first book was about an Elizabethan spy in the service of Sir Francis Walsingham. I had that ready to go when another writer brought out a book on the same subject – I remember reading the review in the Observer. My blood ran cold! So I put that back on the shelf and started a crime novel. Morgen: I used to read Stephen King in my teens (under the duvet with a torch, they were so gripping) and loved Roald Dahl’s Tales of the Unexpected so it was inevitable my writing would have a dark side. I’ve written chick lit, lad lit and mystery, but my heart is with crime too. I started a crime series for NaNoWriMo 2012. What have you had published to-date? Tony: This is my first published novel. I’ve written a book about wartime Darlington and a collection of folk tales but I’ve always pursued film writing, which is an odd sort of career. You are working blind in that you never know if your story will ever see the light of day. I’ve recently sold a script for a feature film but once a script leaves the writer, anything can happen. I’ve loved working on the current book because I’m not waiting for a decision from a producer or commissioning editor. Morgen: I have heard many scriptwriters say how hard it is to get taken up, more so than prose, I think, and many books who have their film rights bought often never come to fruition, which is a real shame because someone saw the potential. I guess it’s all about money. Have you self-published? Tony: I prefer to be a writer, rather than be a publisher. Self-publishing is a very respectable option but I don’t have all the skills to promote a book. I was lucky enough to be approached by two publishers for ‘Cars Just Want to be Rust’. Both were very able but I knew the folk at Crafty Publishing would give it their best shot. Morgen: Are your books available as eBooks? How involved were you in that process? Do you read eBooks or is it paper all the way? Tony: Yes. ‘Cars Just Want to be Rust’ is available as an ebook on Amazon, Smashwords and the Crafty Publishing website. I learned as much as I could about the process – software, layout, publicity. I bought some software, which wasn’t right! I read 50% on the Kindle and 50% paper. Sometimes you just need to hold a ‘proper’ book, don’t you? I love the smell of books – the aroma of ink is intoxicating! Morgen: You do. I’m the same, pretty much. My house is a small library so I think I’ll always be reading ‘pBooks’, then there are so many free eBooks coming my way (I promote many via my 5am Flashes) that they all go on my Kindle. Do you have a favourite of your books or characters? If any of your books were made into films, who would you have as the leading actor/s? Morgen: 🙂 Great choices. Which author(s) would you compare your writing to? Tony: I love George Pelecanos. The world of his stories is so real that you fear for the characters. I enjoy Ian Rankin – the Rebus novels – for the way he incorporates current events into the plot. Another influence is the French writer, Fred Vargas. Her characters are quirky, intriguing – not at all the usual stereotypes. A from the past would be John Meade Falkner, who wrote Moonfleet. He ratchets up the tension by having his character in present danger, while we can see more jeopardy stacking up on the horizon. A recent discovery is Johan Theorin, who wrote the very atmospheric Echoes form The Dead and The Darkest Room. They’re crime novels set on the archipelago of Oland, in Sweden. There’s an unsettling feel to his books – a hint of the supernatural. Morgen: It’s funny. I did Moonfleet at school and can never remember who wrote it. Maybe this time it might stick. Did you have any say in the titles / covers of your books? How important do you think they are? Tony: ‘Cars Just Want to be Rust’ was something a mechanic said to my brother when he complained about the bodywork on his new motor. It suggests the idea of entropy – things fall apart, life moves from order to disorder, no matter how we try to control events. We look to the police to sort out crime, to prevent the collapse into disorder, yet that’s an illusion. They do what they can, but they’re human, just ordinary working people, like the rest of us. Some people have said the title is too long but I disagree – it should to stick in the memory. Long titles haven’t done Christopher Brookmyre any harm! The cover was designed by Leanne Pearce. It’s a beautiful thing, and different. The people at Crafty Publishing did persuade us to ‘crime it up a bit’ and they were right – the original draft looked too much like a book of poetry. Morgen: I think it’s a great title, and an intriguing cover (as they should be). What are you working on at the moment / next? Tony: Right now I’m working on rewrites for the script I’ve sold, which was called ‘Tara’ for a while but now may be called The Darkest Light. I’m working on another script called ‘The Trees’ – a ghost / murder story. And I’m outlining the plot for the sequel to Cars Just Want to be Rust – another novel featuring Kitty Lockwood and some of the same characters. Morgen: Series are so popular and I love bringing characters back (and readers, and therefore agents and publishers, get very attached to them). I’ve done it in my short stories but plan to with my novels so I’m looking forward to developing that. Do you manage to write every day, or ever suffer from writer’s block? Tony: If I don’t write every day I feel twitchy. If I can’t type for any reason, I think about my work – writing in my head, if not on paper! There are times when I don’t know what to write. The good stuff comes when you are relaxed, accessing your ‘Alpha state’, I think it’s called. If I force things it will end up in the bin. But it’s important to write as often as you can – like using a muscle! Morgen: I’ve not heard of ‘Alpha state’, but I like it. I keep reminding myself that 300 words a day is a 100,000 word novel in a year, although there are too many days when I don’t write anything. I have no excuse, I don’t go out to a day job, but the days still whizz by. Do you plot your stories or do you just get an idea and run with it? Tony: I used to write blind, following the line, heading into the wilderness without a plan. But it’s better to think, make notes, dream and live in the world of the story before plunging in. ‘Write with the ending in mind,’ Aristotle said. Otherwise it’s like setting off on a thousand mile journey without a map. The first person who taught me anything about writing was H.W Sutherland, who said that writing novels was trench warfare. It may be less hazardous than that but you do need some sort of battle plan. Morgen: I don’t usually plan either, but I struggled with the last one. I knew setting out it would be a series but I think I’d wing it like the previous five novels but it became a series of character sketches and scenes. There was no harm done, I wrote the 51K in a month (November) so at least it’s down on paper (Word document). They’ll probably be then split over more than the one novel, but then there’ll be a grounding. I plan to start writing synopses for them and see where that takes me, and the characters. Do you have a method for creating your characters, their names and what do you think makes them believable? Tony: I like names that conjure up something about the appearance or the personality of the character. If I get stuck for a man’s name I have a huge reference book of everyone who has ever played first class cricket – I leaf through that until I find something that works. Morgen: That’s a first; usually it’s a baby book or telephone directory. Do you do a lot of editing or do you find that as time goes on your writing is more fully-formed? Tony: I edit the text many, many times. A film script is easy – you can read it in an hour! But the trouble with editing a novel is that it takes a week to read the thing! I go through it – cutting and sifting – right up to the deadline. The way I write is to scribble the initial draft as fast as I can. Then I go through it to check the structure. The next edit is to cut the purple passages. If I think the cut material has some merit I put it aside and – if there’s a place for it elsewhere, re-use it. But ‘kill your darlings’ is always in my mind. My French teacher told me about Prosper Merimee, who wrote Carmen. When he finished a piece he put the manuscript away for several weeks. When he took it out again, it was clear what needed to be cut. Time gives you that perspective on your work. Morgen: I agree. We’re always too close to a just-finished work. It’s best to move on, forget about it, then you’re more impartial when you go back to it. Do you have to do much research? The thing which worried me the most was the procedure – the way police work, the jargon they use. I spoke to serving officers and learned what I could. Things like ‘the big key,’ which is a term for the red battering ram they use to knock down doors in a raid. There’s a sort of black humour in some of the inspeak. Morgen: The advantage of doing these interviews is that I then have experts to fall back on. Andrew Barrett gave me some great advice about undertakers. 🙂 What point of view do you find most to your liking? Have you ever tried second person? Tony: I’d never considered second person, but after reading about it on your blog I’m very intrigued! Morgen: Oh, thank you very much. 🙂 I love it, but it tends to be an acquired taste… and pretty dark, but then you write crime so you might enjoy it. My chick lit novel is first person but the others are third person, which tends to be the most popular pov. Morgen: Wicked behaviour, I like it. 🙂 Do you write any poetry, non-fiction or short stories? Tony: I do write short stories and have had several published. I write scraps of poetry, but I would never inflict those on anyone. They’re fragments that remind me of a feeling, or a moment. They often find a home in longer work. Morgen: That’s pretty much how I feel about my poetry, although what I have shared with writing groups has been well received. I might do an eBook collection. Apart from your poetry, do you have pieces of work that you think will never see light of day? Tony: I have many pieces that were abandoned because they didn’t work. I have a radio play that I love, but which was rejected. There’s no place for them to go. They will live forever in the limbo of the memory stick! Morgen: Perhaps you could eBook them? I’m sure there must be readers out there who love reading plays. I know plenty of them write them. So you’ve had rejections, how do you deal with them? These days I’m more philosophical. To break through you need luck as well as talent. You have to have the right combination of circumstances – the work has to be good; then it has to land on the right desk, on the right day. I have a sixth sense about work that will be accepted. You’re only entitled to be upset when you know it’s good yet it gets knocked back. Morgen: It is, absolutely. It’s just the right thing for the wrong person. Do you enter competitions? Are there any you could recommend? Tony: I entered the Northern Echo New Writer of the Year competition, which I thought was very well run (perhaps because I was lucky enough to win…) But the journalist who ran the competition left the paper so it ended. I’ve entered many competitions. They can be a bit of a lottery but the boost to confidence is important. For that, if nothing else, it’s always worth entering your work. Morgen: I haven’t entered any for a while (I’ve had some success), but I found with the themed ones that they got me writing something new so I still had that to do something else with it if it didn’t get anywhere. Do you have an agent? Do you think they’re vital to an author’s success? Tony: I had an agent – very well known. She told me she’d had lovely feedback from publishers’ readers but she just couldn’t place my books. I got the feeling that she was finding it difficult to understand the way the world was changing. She said ‘I’ve never known it to be so hard to get writers published.’ She knew that the industry was changing and that she was behind the game, playing catch up. The internet has changed everything in publishing, just as it did in the music industry. The relationship between writer, publisher and reader is closer, more direct, more personal. Why do you need another gatekeeper? Good work will still be successful, however it emerges. Morgen: I’ve heard it’s more difficult to get an agent these days than a publisher, and many smaller publishers prefer dealing directly with the author. I know of agents who have either retired or become publishers, a sign of the times for sure. How much of the marketing do you do for your published works or indeed for yourself as a ‘brand’? Tony: It’s something I’m learning about. There’s a resistance to publicising your work – it seems like bragging! Yet people have to know it’s out, where they can get it. There’s a fine line between letting people know they can download your book and becoming a nuisance. I’m just the same – I want to know what’s available, but if my Twitterfeed is jammed with people who only push their books, they get unfollowed! Morgen: They do. I’m the opposite, I say loads about the guests on my blog but too little really about my stuff. I will be upping that when my second’s ready (still in final edit stage, but I hope it will see light in the next few weeks – I’m lucky that I have seven first readers waiting for it!). What’s your favourite / least favourite aspect of your writing life? Has anything surprised you? Tony: My favourite part is the rare days when the words and ideas flow, sometimes faster than I can get them onto the screen or the page of my notebook. The days when it seems like automatic writing. I can’t think of anything I don’t like about writing! Rejection slips. And perhaps the realisation that technology always lets you down – the discovery that you’ve been writing all morning on the wrong draft of your book! I’m surprised that people are interested in the work. That’s truly lovely! To know that someone in Dubai or somewhere has downloaded your book and is reading it in the sunshine. Quite an amazing feeling. Morgen: I’m very fortunate that when I set aside time to write, it flows. I just need to be more ruthless with my bouts of procrastination. What advice would you give aspiring writers? Tony: Write. Then rewrite. That’s it really. Alan Plater told me that you can’t teach people to write. They can do it or they can’t – but practice makes the best of what talent you have. Morgen: Like painting and playing the piano. If you could invite three people from any era to dinner, who would you choose and what would you cook (or hide the takeaway containers)? Tony: Christopher Marlowe, without a dagger, I hope. Kristin Scott Thomas. And Mary Shelley. Morgen: Nice. If I’m ever in Newcastle… If you had to choose a single day from your past to re-live over and over, what day would it be and why? Tony: There was the day I won BBC North Playwright. Peter Flannery presented me with a giant cardboard cheque! The days my daughters were born. It sounds cheesy but I think I’d pick the day I got married – by the end my face ached from smiling! Morgen: Not cheesy at all, a great character for a comedy, I’d say. Is there a word, phrase or quote you like? Morgen: I loved his ‘The Outsider’, but then I love books I can read in one sitting, especially if they’re quirky. Are you involved in anything else writing-related other than actual writing or marketing of your writing? Tony: I teach Film Writing at the University of Northumbria. I work there part time – only a few hours a week, which is good. Any more and it would become my ‘job’. But it’s so good to have contact with real people in the outside world! Morgen: I technically see less people now I’m not ‘working’ but there were only two of us in the office most of the time, four maximum, whereas now I take my dog to the park every day and meet more than that… plus they’re invariably different every day so a field of potential characters. 🙂 What do you do when you’re not writing? Any hobbies or party tricks? Morgen: <laughs> Are there any writing-related websites and / or books that you find useful? Tony: The best book on writing I’ve come across is The Writer’s Journey, by Christopher Vogler. It’s aimed at scriptwriters, but it applies to all forms of story telling. It was inspired by the work of the mythologist, Joseph Campbell, and shows how mythic structure can be used to create powerful stories. I find the BBC Writers Room website very useful. Morgen: They are great. I used the blank TV script layout on the Writers’ Room when I did (now defunct) Script Frenzy in 2010, and I have Christopher Vogler’s book, although I’ve only ever dipped into it (it’s one of three shelves of writing books). Are you on any forums or networking sites? If so, how valuable do you find them? Tony: I’m on North East Screenwriters. I’m on the Crafty Writer site. I’m on Goodreads. You often come across an interesting technique or nugget of information. Morgen: I like LinkedIn for that. Although I’m on Goodreads, I’ve not really explored it, which I should because the harshest reviews of my eBooks have been on there. What do you think the future holds for a writer? Tony: Stories will never go out of date. I wrote a short piece on the Crafty Writer site about the neurochemicals produced when we read a satisfying story – cortisol and oxytocin. We all get a chemical high from hearing a story – if it’s well told. The desire for stories is deep wired in our brain and DNA. Thousands of years ago it would be campfire tales told by hunter gatherers – now it is film, books, radio, television, e books, as well as the spoken word. But it’s interesting that none of the older ways of telling stories dies – video didn’t kill the radio star! Though I’ve never been convinced by interactive story telling – we want to be told a story. Listening to a good story is like settling into a warm bath. It’s a holiday from the real world. Computers have transformed the way stories are delivered but one thing they cannot do is create content – I know there are story or plot generators on the web but they’re rubbish! So I’m optimistic about writers. The future’s bright! Morgen: I think so too, and (without wishing my time away, it goes quickly enough already), I can’t wait! Where can we find out about you and your writing? Tony: There’s a Facebook page for Cars Just Want to be Rust. There’s a new website http://tonyglover.net. And there’s the Crafty Publishing site too. Tony: I’m curious about how you find time to fit in writing with running your website? Morgen: <laughs> I don’t. Well, that’s not strictly true. Last year I wrote a story a day from May 1st until October 31st, although most were less than 500 words. I then write the beginning of my sixth novel for NaNoWriMo but they’re all still waiting for me to do something with them. I should balance my time better but I get so many emails that I spend too much time on them. I don’t like to keep people waiting, although it’s inevitable. I try to keep my inbox lower than 50 emails but it’s usually hovering around the 100. It’s one of my targets for 2013 is to have a better balance. Thank you, Tony. Kitty tripped over a tangle of ragwort and fell. Nathan took her wrist and pulled her up. Then he jabbed the gun into her back, pushing her towards the trees. They reached the stone wall that surrounded the plantation. ‘Why not Dorian too?’ she said as she watched him climb the stile. He ignored her. They moved into the wood. Sunshine gave way to a cool, grey gloom. Above their heads a mesh of branches and needles blocked out the sun. With every step the light faded, the wood growing more silent. There was no birdsong in here. The only sound was the breeze singing through the tops of the trees. The mat of fallen needles deadened their footsteps. The scent of leaf mould hung in the still air. The earth was barren, as dead as the ocean floor. ‘Dorian heard your name,’ she said. He was silent. It was like a dream in which Kitty walked along the sea bed, following her daughter into the darkness. As she touched Molly’s shoulder, Kitty could feel the slender bones moving beneath her daughter’s skin. When WPC Kitty Lockwood investigates a ‘routine’ domestic abuse case, she is drawn into a world more sinister than she ever imagined. While fighting the demons of her past and the chauvinism of her present, Kitty unearths a terrifying secret that could destroy her and all she holds dear. 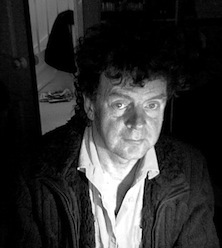 Tony Glover is a writer and film-maker, born in Ponteland, Northumberland. 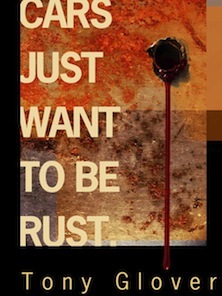 His first crime novel, Cars Just Want to be Rust, is published by Crafty Publishing and is available through their website and Amazon. A radio play, Just a Trim, won a Sony Radio Award and the title of BBC North Playwright of the Year. Irene’s Story, a film about bi-polar disorder, won a Millenium Award. His film Posh Monkeys won a Royal Television Society award. It was promoted by the British Council at the Angers, Munich, BAFTA, BP Expo and New York film festivals. Stage plays include Chase Me I’m Chocolate, Slappers (Unity Theatre Liverpool) and The Stars that Surround Us (Cloud Nine Theatre Company at Newcastle Playhouse). Sticky Fingers won the People’s Play award and was staged at the People’s Theatre. Recent work includes Year of the Tiger, filmed by Wildcat Films for Yorkshire Tyne Tees. Tony is currently working on two film scripts and a sequel to Cars Just Want to be Rust.